Diamond Schmitt Architects has designed the new Environmental Sciences and Chemistry Laboratory at the University of Toronto’s Scarborough campus. The 10,219-m² (110,000-sf) research and teaching facility includes a state-of-the-art facility integrating modern design with institutional objectives for sustainable targets. The American Concrete Pavement Association (ACPA) has recognized the Canadian Concrete Association (CCA) with the 2014 Sustainable Practices Recognition Award. 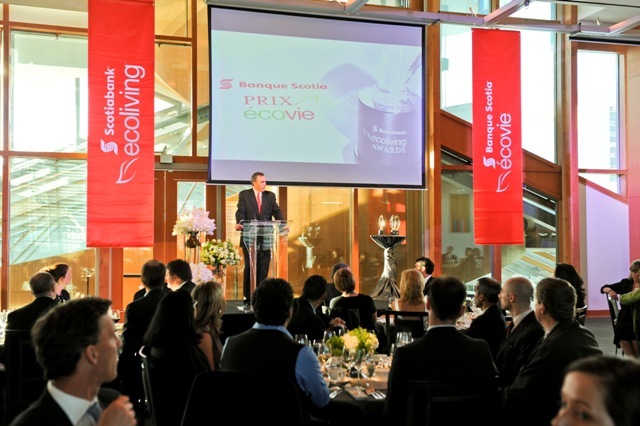 Scotiabank’s Anatol von Hahn welcomes guests and finalists to the 2011 EcoLiving Awards Gala held in Toronto. Photos courtesy Scotiabank. The largest ‘green’ awards program in the country, Scotiabank’s EcoLiving Awards, is now accepting submissions for its second year. The awards program is a part of the company’s overarching eco-living initiative which informs Canadians about ways they can save on energy costs. It recognizes businesses, individuals, and students with a total of $75,000 in prizes for product and service ideas that will improve the energy-efficiency of homes. 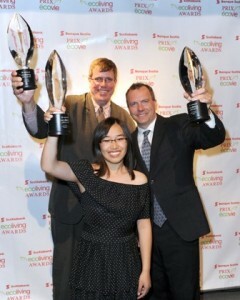 Grand-prize winners, Axel Lerche, Eden Full, and Shaun Loney celebrate their win at the inaugural EcoLiving Awards. The top prize is a $50,000 Business Leadership Award, honouring a business that provides products or services that improve the energy-efficiency in residences. A winner is also selected by the jury panel for the $15,000 Innovation Award for a product prototype and a $10,000 Student Leadership Award, recognizing a post-secondary student’s eco-friendly solution idea. “EcoLiving helps get Canadians thinking and acting on ways that will allow them to reduce energy costs and at the same time reduce their overall energy usage footprint,” explained Flinn. Last year’s Business Leadership Award went to BUILD, a contracting company who hires and trains employees locally to retrofit low-income homes with energy-saving features. Further information and entry submissions can be accessed through the Eco-Living website until February 15, 2013.